Arnold Machin in later life. Taurus the Bull, modelled by Arnold Machin in 1945. Produced by Wedgwood, 1950, earthenware and transfer printing. The design includes the signs of the zodiac. Machin's portraits of Queen Elizabeth II: as used on decimal coinage from 1968 (left), and on a British postage stamp of 1969. Arnold Machin O.B.E., R.A. (/ˈmeɪtʃɪn/; 30 September 1911 – 9 March 1999) was a British artist, sculptor, and coin and stamp designer. Machin was born in Stoke-on-Trent in 1911. He started work at the age of 14 as an apprentice china painter at the Minton Pottery. During the Depression he learnt to sculpt at Stoke-on-Trent's Art School, which was opposite the Minton factory. In the 1930s he moved to Derby, where he worked at Royal Crown Derby and met his wife Patricia. He went on to study at the Royal College of Art in London. After imprisonment in the Second World War as a conscientious objector, he returned to modelling and sculpture, and created many notable ceramics which are now prized collectors' items. In 1947 he was elected an associate member of the Royal Academy, was appointed a Master of Sculpture from 1959 to 1966 and became the longest-serving member of the Academy. He was elected an Academician in 1956 and a Fellow of the Royal Society of British Sculptors. From 1951 he was a tutor at the Royal College of Art. In 1964 Machin was chosen to design a new effigy of the Queen for the decimal coinage, which was to be introduced from 1968. This effigy was used for all British coins until 1984. It was first used on the coins of Rhodesia in 1964, coins of Canada from 1965 to 1989, Australia from 1966 to 1984 and New Zealand from 1967 to 1985. In 1966 the Queen approved Machin's similar design for an effigy of her to be used on what came to be known as the "Machin series" of British definitive postage stamps. Machin produced a bas-relief in clay which, when combined with a different coloured background, is reminiscent of the overlaid decoration of potteries such as Wedgwood. The design was first used on the 4d value which was issued in June 1967, and has been used on all British definitive stamps (except more recent regional issues) ever since. It is thought that this design is the most reproduced work of art in history with, to date, approximately 320 billion copies produced. On several occasions the Queen has been approached with suggestions for the replacement of the Machin stamp portrait. Although she has considered alternatives, she has never approved any new design, stipulating that any such replacement would have to be "a work of real quality". In 2007 the Machin-designed stamp was still in use at its 40th anniversary and to mark the occasion, the Post Office issued a commemorative stamp featuring a photograph of Arnold Machin. It was also available for sale in a miniature sheet which incorporated another stamp with a reproduction of a Machin series stamp as well as two £1 Machins in different colours. In the year 1956, while resident at number 15, The Villas, Stokeville, (an estate of 24 Victorian houses in Stoke-upon-Trent) he received publicity in the national press when he chained himself to an old metal lamp-post in protest at its planned removal. Machin's protest, "against the destruction of all the beautiful things which is going on in this country" did not prevent the lamp-post from being replaced by a concrete one; however, it was given to him for his own garden and his wife Patricia unlocked him. The lamp has since been restored to its original position. After Francis died, the possessions of Arnold Machin in his house near Eccleshall in rural Staffordshire were sold in auction. The possessions included the fourth of the final plasters known made to create the Machin stamp series, the three others are kept in the Royal Mail archives. Minor planet 3109 Machin is named in his honor. ^ a b Maureen Batkin (15 March 1999). "Obituary: Arnold Machin". The Independent. Retrieved 20 June 2015. ^ "Arnold Machin chained to lamp (scan of press cutting)". The Sentinel. July 1956. Archived from the original on 16 July 2011. Retrieved 20 June 2008. ^ "Did you know - Arnold Machin - the sculptor of the "Queen's Head" was born in Stoke-on-Trent". thepotteries.org (Press Cutting: Daily Mail). 12 July 1956. Retrieved 25 June 2010. ^ Richard Alleyne, "Arnold Machin plaster cast used for image of Queen on stamps is found", Telegraph.co.uk, updated 3 September 2008 ; available on the website (last retrieved, 26 October 2008). ^ (3109) Machin In: Dictionary of Minor Planet Names. Springer. 2003. doi:10.1007/978-3-540-29925-7_3110. ISBN 978-3-540-29925-7. Wikimedia Commons has media related to Arnold Machin. Mary Gaskell Gillick was a sculptor best known for her effigy of Elizabeth II used on coinage in the United Kingdom and elsewhere from 1953 to 1970. Mintons was a major company in Staffordshire pottery, "Europe's leading ceramic factory during the Victorian era", an independent business from 1793 to 1968. 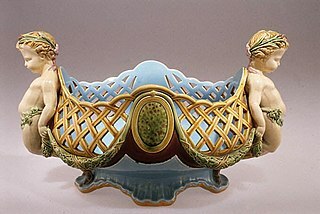 It was a leader in ceramic design, working in a number of different ceramic bodies, decorative techniques, and "a glorious pot-pourri of styles - Rococo shapes with Oriental motifs, Classical shapes with Medieval designs and Art Nouveau borders were among the many wonderful concoctions". As well as pottery vessels and sculptures, the firm was a leading manufacturer of tiles and other architectural ceramics, producing work for both the Houses of Parliament and United States Capitol. The Castle series or Castle High Value series are two definitive stamp series issued in the United Kingdom during Queen Elizabeth II's reign. The common aspects of the two series are the four chosen castles, one for each country of the United Kingdom. The Villas, Stoke-On-Trent, is an estate of 24 Victorian houses in Stoke-upon-Trent, England. Originally a distinct settlement set in green fields, it now merges with the late 19th- and early 20th-century suburban sprawl along London Road below Penkhull village on the outskirts of Stoke-on-Trent and within the ward of Stoke and Trent Vale. Henry Lark Pratt (1805–1873) was an English painter who trained in the porcelain industry.